OmegEssentialÂ® FORTÃ‰ Maximum Strength Fish Oil is designed to provide a more therapeutic dosage intended to address specific health challenges. This includes promoting healthy mood balance, supporting cardiovascular health, reducing serum triglycerides and easing the pain of Rheumatoid Arthritis. Each serving provides 1,700mg of EPA and 850mg of DHA in a balanced 2:1 ratio. It also includes a family of support nutrients designed to naturally enhance your body’s ability to process and utilize the essential fatty acids. 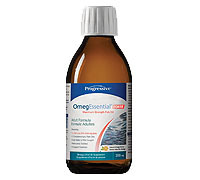 Each serving of OmegEssentialÂ® FORTÃ‰ provides 1,700 mg EPA and 850 mg DHA from small, cold water, wild caught fish oils. To eliminate contaminants, the oil has been highly purified through molecular distillation. OmegEssentialÂ® FORTÃ‰ contains Almond Oil, Extra Virgin Olive Oil and Lemon Oil. These oils naturally support liver and gallbladder function, improving your body's ability to assimilate essential fatty acids and receive maximum benefit. 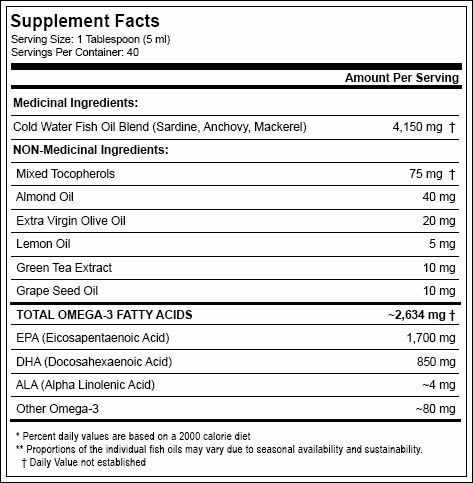 OmegEssentialÂ® FORTÃ‰, Maximum Strength Fish Oil, has been IFOS approved. IFOS (International Fish Oil Standards) is an international program for verifying the purity and potency of fish oil products. This includes a full spectrum of laboratory testing for contaminants (including PCBs, Dioxin and heavy metals) as well as quantitative testing to confirm the potency of the active ingredients. IFOS also tests for rancidity, a common problem with fish oil supplements that have not been properly stabilized. The IFOS standards are established in conjunction with the World Health Organization and the Council for Responsible Nutrition. The fish oil blend in OmegEssentialÂ® FORTÃ‰ received IFOS's highest rating of 5 stars. To view our recent IFOS testing results, follow these 3 easy steps. Enter the lot number from your bottle or select 'Combination' from the available category options. If you selected 'Combination', scroll down and select 'Progressive Nutritional Therapies'. Purity and potency aren't the only considerations. Selecting fish from a sustainable population is also a top priority. The fish used to create OmegEssential™ are primarily caught off the coast of Peru. The fishing methods follow the FAO code of conduct for responsible fishing and leave the seabed undisturbed. The Peruvian government manages the fisheries through the Ministry of Production and the Vice-Ministry of Fisheries. They follow and enforce the principles of protecting the eco-system, preserving bio-diversity and sustaining their marine resources. In 2008, the sustainability of Peru's fisheries and marine eco-system was ranked "Best in the World" of the 53 fish producing countries surveyed. Sunflower Oil, Natural Orange Flavour, Stevia Extract. Contains no artificial flavours, colours, sweeteners or preservatives of any kind.